My brain is often at war with my body. I want to do more. More! More! Yes, on days like this my brain sounds like a strange combination of yearning romance novel heroine and petulant child. Such is the hidden world of Fibromyalgia. My body dragged itself out of bed to start another day. Not really sure why I have a bed sometimes, but at least it’s there for rest and decoration. I also once again failed to get the license number of the Mack Truck that hit me while I was sleeping. With FMS another day means more pain, fatigue, frustration, disappointment, doubters and just more of less. I don’t expect anyone who doesn’t live with Fibromyalgia to understand it. I don’t have cancer, that doesn’t mean I can’t have empathy and understanding for those that do. Or ALS, MS, CP, Diabetes, Autism, depression, heart disease, stroke, Alzheimer’s, etc. Doesn’t mean I can’t understand a man because I’m not a man. Or the rich because I’m not rich. As human beings we have a wealth of empathy, understanding, and compassion available to us at any time. 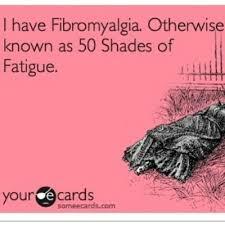 I get some people think Fibromyalgia is made up by lazy or unmotivated people. Ok, why do doctors and other professionals go along with it, what’s in it for them? They have more than enough patients, unfortunately cancer alone keeps them pretty busy. 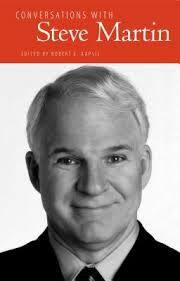 So it hasn’t been my day, my week, my month, or even my year, but I do know that laughter is truly the best medicine so I thought today was a good day to review Conversations with Steve Martin edited by Robert E. Kapsis (University Press of Mississippi). Thank you Netgalley.com for letting me borrow this ARC copy, available in stores early September 2014. I’ve already had many conversations with Mr. Martin in the last 35 years – usually he’s wearing an arrow through his head or bunny ears, or a balloon hat, playing his banjo, getting Happy Feet, dressed in a King Tut outfit, and/or eating tiny chocolate cookies while juggling small cats. 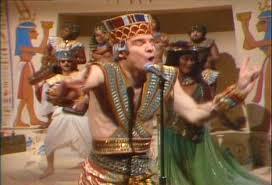 No cats were harmed in my fantasy conversations with Steve Martin. 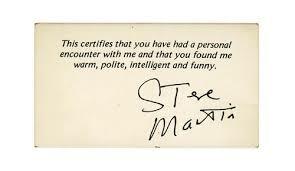 Conversations with Steve Martin highlights Martin‘s contributions not only as a comedian, but as a writer, musician, artist, and free-thinker through a series of interviews and profiles. It’s sort of a living eulogy of Martin’s rollercoaster career over the past 4 decades. 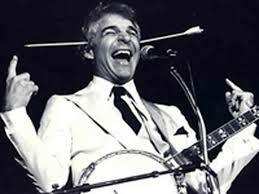 Steve Martin has thrilled and disappointed audiences for decades with his ever-changing style, from eccentric, incongruous, and wacky to mature to sinister to bizarre to mellow. As much as I’ve enjoyed some of his later work, I sometimes miss the wild and crazy guy, the Cruel Shoes, King Tut, Dead Men Don’t Wear Plaid, The Jerk, The Man With Two Brains https://yadadarcyyada.com/2013/11/27/the-man-with-two-brains/ and more. That being said, I’m so glad he moved on and didn’t get stuck. If you’re a Steve Martin fan this latest book is ubercool, if you’re not, well, excuuuuuuuse me! Laughter may not fix all the world’s problems, but it sure does know how to make them seem less dire. I think tonight will be a Steve Martin movie night. Thank you Mr. Martin for another lovely conversation, next time, you bring the cookies. In high school, I made an off-hand remark about Steve Martin being “pretty cute for an old guy” (because, when you’re in high school, anyone over 30 is old). One friend picked up on this and was forever after commenting on my crush on Steve Martin. Then, for Christmas, she bought one of those beefcake calendars called “A Man for All Seasons” and pasted photocopies of Steve Martin’s face on each month. She re-titled it “A Martin for All Seasons” and presented it to me in home room. I’m adding this book to my to-read list. lol That is so funny. I agree, I thought he was so hot when I was in highschool, I still think he’s adorable. 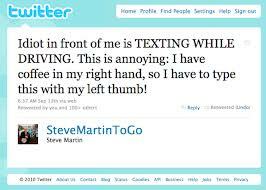 And now I’m following Steve Martin 🙂 I hope that the flare fades and you can rest! Thank you so much Kate, I really hope so too. Fibro flare days are such a drag. I’m glad you got a funny guy like Steven Martin to keep you company during a few of them, even if in book or fantasy form! i hear you, hear you loud and clear. Fibromyalgia is not a condition to be diagnosed with. There is no one medication that has been developed with usually a cocktail offered to treat symptoms that usually have unwanted side effects. However, it does not dampen the creative spirit or output as you will find in yesterday’s post on yadadarcyyada – take some cookies with you. I am definitely a Steve Martin fan! 🙂 His movies make me laugh, and I did watch “The Muppet Show” episode with him in it as well. Fibromyalgia is an awful thing. And it’s very real. Just sit in a pain management group with people who have it, and you’re left with absolutely no doubt. I have. I hear you too! You are not alone with this invisible disease. I have one too. It’s not fibromyalgia, for me it’s Arachnoiditis. And no one’s heard of that one, lol. Spoon theory says it all. Take one day at a time, one minute if you have too. Pain management is a must. I don’t know where you live but find a good PM doc and stick with it. 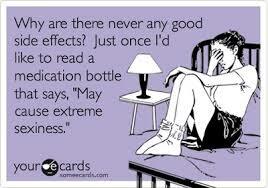 Sometimes it takes awhile to find the right combo of meds. Once they do your life will change for the better. Keep that chin up, and when brain fog gets to you, Just laugh as much as you can. Hugs! It’s an ebb and flow, some days are better than others. I’ve heard of Arachnoiditis, and how painful and difficult it is. I’m glad to hear you have pain management. I popped over to your blog, too many delicious recipes and giggles!!! It’s good to find others who understand, so many people don’t. The lorries get you, too?!!? What about that b*****d with the hammer? Dear friend I hope you are getting some good help and lots of love. Hang in there. #BloggersPitStop is certainly hopping, as always, thank you for the generous support of bloggers.